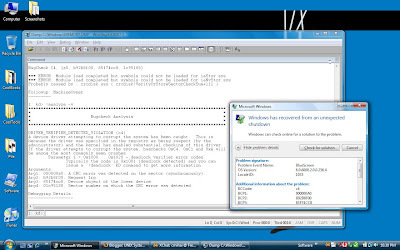 Cloud Architecture and Technology Blog: Windows Crash Dump Analysis - Pinpointing Faulty Drivers with Driver Verifier and WinDbg. Windows Crash Dump Analysis - Pinpointing Faulty Drivers with Driver Verifier and WinDbg. I've been having problems with my system lately, random freezes or crashes (BSOD, DRIVER_IRQL_NOT_LESS_OR_EQUAL, etc). Since the system passes memtest86+ and Vista memory tests, and it is updated to the latest and greatest patch level, I'm pretty sure the problems are caused by 3rd party drivers. 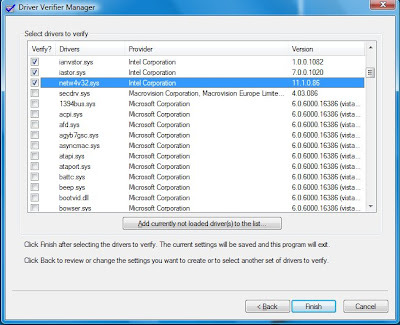 I'm going to use a very overlooked tool in Windows, and that is the "Driver Verifier". This tool has been a part of Windows systems ever since Windows 2000, and it's an invaluable tool in debugging faulty drivers. You'll need to run the tool manually, just start - run - verifier.exe. A wizzard will pop up. You'll need to create custom settings, Select individual settings from a full list, and pick everything but "Low resource simulation". You can now either pick unsigned drivers (the usual suspects, since signed drivers are usually tested) or select driver names from a list (pick the ones you most suspect... recently installed before crashes appeared and so on). Make sure you don't pick ALL drivers on your machine, that's quite painful. In my case, I've picked drivers not provided by Microsoft. To be more specific, the Intel Turbo Memory (Robson) Driver, since this is a Santa Rosa platform laptop, and Turbo Memory isn't really know for it's stability or performance boosts. In fact, some laptop providers like HP have said NO to Turbo Memory. iaStor.sys is the Intel Matrix Storage Manager Driver and ianvstor.sys is the Intel Turbo Memory (Robson) driver. Both install with the Intel Turbo Memory driver. Investigating Intel's Turbo Memory: Does it really work? After this change you'll need to reboot your system, and wait for a crash to occur. Just in case your system will freeze, it's generally a good idea to boot your system in Debugging Mode (F8 at startup) and make sure you have full memory dumps and CrashOnCtrlScroll enabled. Once you've managed to obtain a crash dump (either by a BSOD or connected a debugger to a hanged system and typing .dump, or even crashing the system yourself with Ctrl - Scroll Lock - Scroll Lock in case of a hang) you'll need to analyze it. For this task, you'll need Windows Debugger (WinDbg) and a Debugging Symbols Server. You can grab them off Microsoft's website. Just make sure they're the right ones for your system. Once you've got yourself a debugging environment set up, open WinDbg, pick File - Open Crash Dump (Ctrl - D) and open the fresh memory dump (C:\Windows\MEMORY.DMP by default - check the Startup and Recovery Tab to make sure). 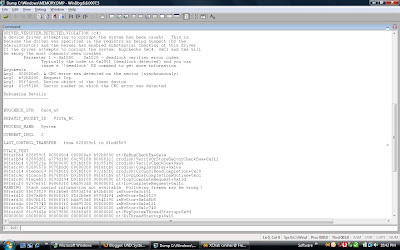 As we can see in the image, it did not find any debugging symbols for the iaStor.sys and iaNvStor.sys drivers (the Intel Turbo Memory Drivers) since they are 3rd party drivers. We're going to type "!analyze -v" to get more details on the error. That's the Intel TurboMemory driver (well, the Intel Matrix Storage Manager to be more exact). Since this is a Core 2 system, we have CPU 0 and CPU 1. To run instructions on CPU 1, we need to switch to it, using the ~1 command. 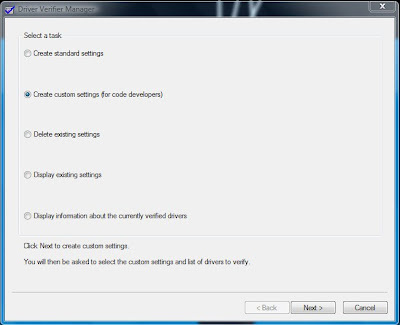 This tells us the driver version and timestamp, to let us know if an update is in order. Usually old drivers are suspect. !analyze -v gives a detailed heuristic analysis of the problem, and looks for 3rd party drivers that might be responsible for the crash. !vm prints memory usage. If pool usage is close to pool maximum, then a driver might have a memory leak. !poolused if pool tagging is on (by default on 2003+) displays kernel memory usage pools by pool tag, and allows you to map the pools back to the drivers. Mapping it for 3rd party drivers require you to grep printable strings in the driver. See "!poolused c". !thread examine current thread (run on each CPU). If a driver interrupts a running thread, this may not list the cause of the crash. !process 0 0 list active processes. Look for suspect processes that shouldn't be running, or common 3rd party processes that show up in multiple crashes. Since all results point at the Turbo Memory drivers, and while working I've got another couple of crashes, with similar results (Probably caused by : iaNvStor.sys ( iaNvStor+3523 )), I've got two choices here: either look for updates or remove the driver, and stop using Turbo Memory. Since most benchmarks say it doesn't provide an actual performance boost, and may provide a mild battery boost, I concluded it's safer to just remove the driver, and stop using Turbo Memory on this machines. The Windows Experience Index on this machine is 4.7 with Turbo Memory enabled, 4.7 with Turbo Memory caching disabled. No change in performance (Sure, the Experience Index may be no proper benchmark, but it's more than relevant in this case). Please insert the Windows recovery CD. Windows failed to load because a critical System driver is missing or corrupt. Well, that was fun. At least restoring BOOTSECT managed to fix things. Broken memory: Make sure you run memtest86+ or Vista's Memory Tester (boot the DVD and pick Memory Test). Drivers for small time hardware like keyboards with "special" keys or 8 button mice and so on. My advice is simple: avoid such drivers at all costs. The functionality they add is minor, and the risks and stability problems are not worth it. If your keyboard's "Email" button requires a kernel module, forget about it, the idea is broken by design. And remember, if you have problems, make sure you obtain a memory dump for analysis, and always perfrom a hardware test before blaming it on software: a full POST, a memtest86+ test, a CPU Prime95 test, monitor system temperatures and disk S.M.A.R.T. data with HD Tune, check your hardware cabling and such, then look at the software. Mainly, at the drivers: remove unneeded 3rd party drivers, software (use Sysinternals autoruns) and hardware, install the latest driver versions, update to the latest Windows patchlevel. Especially avoid Logitech's itouch product, it's broken by design.